Get Access to our Free Online Seminars and Subscribe to the Budgie Training Mini Course and learn more about Budgie Training, Diet, Care & Health - FREE!! Budgies (budgerigars) are an extremely popular pet bird, and for good reason. These small parrots make delightful pets, and are usually friendly and easy to tame. While they can sometimes be difficult to understand, they are quite capable of mimicking speech. 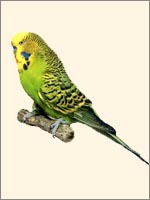 The typical coloration of the Budgie is green with black bars on the wings, back and head. Mature females have a tan or beige cere (nose) and the males have a bluish cere, but this is unreliable in some color variations and young birds of both sexes have pink ceres. If your Budgie has become too noisy or disobedient or aggressive, our Budgie Training Course will teach you how to train it and stop it from screaming and biting. 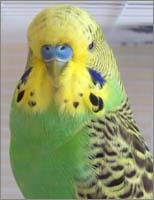 The word "budgie" is short for budgerigar, which is a native green and yellow bird in Australia. Budgies are small, colorful birds that are found in large numbers in the desert interiors of Australia. Not all Budgerigars are easily tamed. But once tamed, the budgerigar can be taught to talk, but only in "parrot-fashion." Some Budgies may be sensitive while others might get into mischief at every opportunity. Well-trained Budgies are a delight in your life but stubborn ones can wreak disaster. Some Budgies are stubborn by nature while others are very sweet. The Budgies are friendly, cheerful companions for all age groups, and are particularly suitable for flats and other situations where a larger pet may not be practicable. Basically, gentle and docile bird, Budgies are very easy to tame if acquired at a young age. They are also very playful and active, and quieter than some other parrots although some of them can still be noisy. The Budgies are quite famous as pets. Budgies are quite birds and are of non-destructive nature. With proper training and attention they turn into great pets. Their gentle and entertaining nature helps them to bond with the entire family members. Budgies possess imitating and acrobatic skills. However, Budgies come with different personalities. Some are cute and sweet and some are stubborn while some are sensitive. They also love getting into mischief. With careful training and guidance Budgies can develop amazing vocabulary list. The Budgies are active and playful and should have a large cage to allow room for toys and exercise. Horizontal cage bars offer the best opportunity for climbing and exercise. There should be space to place at least a couple of perches at different levels with enough space to comfortably move between them. Offering a variety of perch sizes will help keep the feet in good shape. Since commercial food does not meet your bird's nutritional needs, a Budgie strives best on grains, fresh vegetables, nuts, seeds, pellets and meats. In the while they eat fruit and berries, so these can be a nice addition to the diet. Some whole grains such as cooked quinoa, sprouted bread, and millet on occasion. Vitamin and calcium supplements should be added in their diet from time to time. Remember, your pet's diet will improve its health and will keep it content. Although hardy birds, but the Budgies are prone to accidents owing to their small size. They are also very sensitive to their environment; therefore, hygiene and cleanliness must be maintained. Water should be changed everyday and food should not be kept over 3 hours in the cage. Clean their cage with anti-bacterial solutions from time to time. How To Keep Your Budgie Healthy? Free Online Seminars on Training Your Budgie: Join our training experts on one of our FREE online seminars and learn how to train and take care of your Budgie correctly. When you subscribe to our FREE online seminars and email course on Budgie, you will discover the natural instincts of your Budgie and learn about Budgie training, diet and care - FREE! !